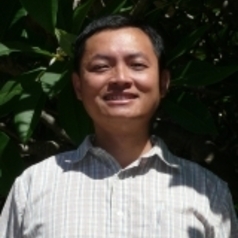 Daniel Tan graduated from the University of Queensland with a BAppSc (Hort Tech) (Hons 1) in 1991 and a PhD in 1999. In 1992, he was a senior executive at Keppel Land International Ltd in Singapore, and in 2003, he accepted a lectureship in agronomy in the Faculty of Agriculture Food and Natural Resources (FAFNR). He was promoted to Senior Lecturer in 2010 and to Associate Professor in 2015. Daniel has been the Dean’s nominee (member) of the Plant Science Management Committee and the FAFNR representative to the Faculty of Science Publicity Committee since 2004. He has been the unit coordinator of The Rural Environment (AFNR1001) and Climate and the Environment (AFNR1002) since 2004. He was also the degree coordinator for the Bachelor of Science in Agriculture and the Bachelor of Horticultural Science from 2007 to 2008. From 2011, he has been unit coordinator of the 4th year units, Crop and Pasture Agronomy (AGRO4003) and Sustainable Farming Systems (AGRO4004). Daniel has been a member of the Australian Institute of Agricultural Science and Technology (AIAST) since 1991. In 2005, he was elected to the Management Committee of AIAST (NSW Division), and represented AIAST in the Department of Education Science and Training (DEST) Steering Committee for audit of Science, Engineering and Technology Skills. He was been Vice President since 2004, and was elected President of the NSW Division from 2011. In recent years, he has presented papers at the International Crop Science Congress in Brisbane, the World Congress on Allelopathy in Wagga Wagga and the 4th International Cotton Conference in Texas, USA.